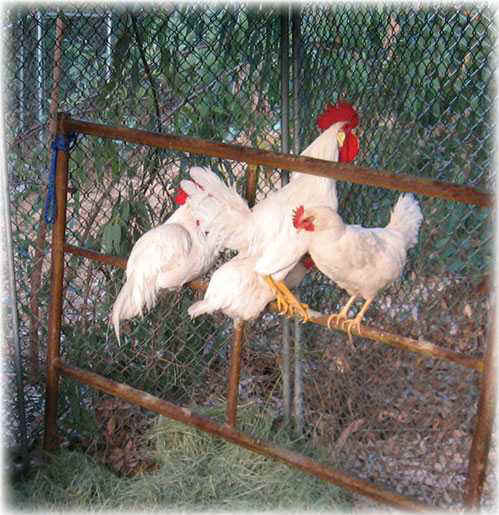 It was a precious moment when Rabbi Leider of Chabad University City here in San Diego agreed to let us have the four chickens they used this year in their kapparot chicken “swinging” ceremony and save them from slaughter in exchange for a donation to charity. On September 25, following the ceremony, two beautiful hens and two beautiful roosters were temporarily housed with the County of San Diego Department of Animal Services while we worked on finding the chickens a good home. 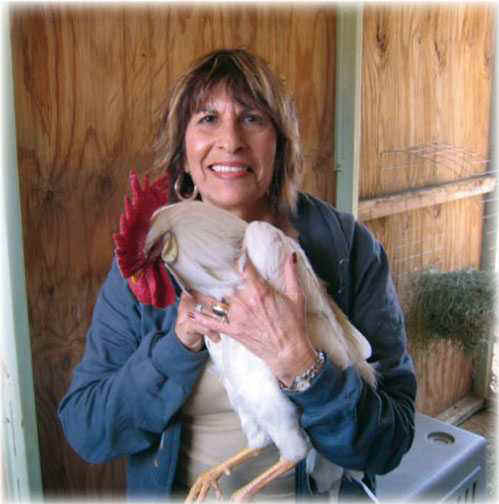 While there were people who would gladly adopt the hens, no one could take the roosters, and we wanted to keep our little rescued flock together. We ended up finding a perfect home on Craig’s List, on the Internet. On October 4, we gathered up our sweet feathered friends and drove them to Stephanie Ward’s ranch in Campo, California. We’d already named the large rooster Houdini, because of his escape artist tactics when we first rescued him - “no more abracadabra for me!” is what he seemed to be telling us, trying to get away! When Houdini first got into his new house at Stephanie’s, he just strutted around looking so tall and proud. The other chickens held back at first, but soon the smaller rooster stepped into the new area, followed by one hen and then her companion. The chickens seemed so inquisitive and happy in their new home, and we shared their joy.